Australasian Christian Writers: CWD & ACW - What's The Difference? CWD & ACW - What's The Difference? We’re looking forward to showcasing the writing from Christian writers in Australia, New Zealand and the wider Australasian region on our group blogs this year. 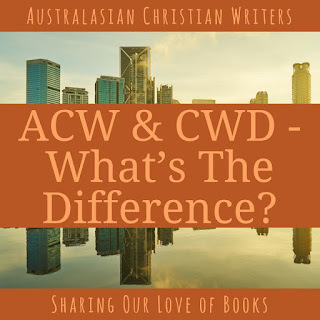 On the first Monday of each month we share a cross-post on the Australasian Christian Writers (ACW) and Christian Writers Downunder (CWD) group blogs. Many of our group members have asked why we have two group blogs for Christian writers in our part of the world. Today we’re going to answer your questions concerning ACW and CWD and let you know how you can contribute to each of the group blogs. Question 1. What’s the goal and purpose of ACW? Narelle: Our overall goal for ACW is to connect writers and readers who enjoy reading a wide range of genres including fiction, non-fiction and children’s books. We're planning a few changes for 2018 to engage with readers more on our blog and in our Facebook group. Our blog members include Christian writers who are traditionally published, indie published, and aspiring to publish. Some are writing for the Christian market, while others are writing for the general market. Many are targeting the US market, as that is where most readers are based. Although we focus on supporting writers and readers in Australasia, we welcome international writers and readers on our blog and in our ACW Facebook Group. We actively promote books on our blog and social media, including Facebook, Twitter @ACWriters and Pinterest. Question 2. What’s the goal and purpose of CWD? Jeanette: Christian Writers Dowunder is aimed at Christians writers (and those associated with writing field, e.g. editors, illustrators, reviewers and publishers) who live in or are from Australasia. We aim to provide a safe and encouraging place for Australasian Christians who write – whether they are taking their first baby steps on their journey as a writer or have been travelling this road for some time – to ask questions, celebrate milestones (new releases, awards, or finishing a first draft), interact, pray, encourage, help and inspire each other. We encourage mutual support through social media and other means. We have a CWD Facebook Group, Blog and Twitter list. In the past we published an anthology with contributions from members, Glimpses of Light. Like ACW we are also an affiliate of Omega Writers. Question 3. Who can join the CWD Facebook Group? Christian writers – whether just starting out or veteran, whether writing non-fiction or fiction, poetry or blogs, whether published or unpublished, whether aiming for the Christian or general market or both, and also Christians associated with writing – editors, illustrators, publishers, reviewers. We encourage our members to share their milestones and new releases, but discourage spamming the page or being argumentative or disrespectful to others. While we will accept applications from Christian writers from outside the Australasian area, if they have an active friend in CWD or a trusted recommendation, our primary focus is ‘Downunder’. Question 4. Who can join the ACW Facebook Group? Narelle: We welcome writers and readers from around the world in our Facebook Group. We have group etiquette guidelines regarding self promotion by authors in our Facebook Group, particularly that we don’t allow promotion of books published by vanity presses. Question 5. How can you contribute to the ACW blog? Narelle: We post five days per week, Monday-Friday, and we set up our ACW blog calendar many months in advance. We will start organising the May-August 2018 blog calendar in early March. I encourage all writers who are interested in contributing blog posts to join the ACW Facebook Group. Blogging opportunities will arise from time to time which we’ll post in the Facebook Group. Please contact either myself, Iola Goulton or Jenny Blake if you’re interested in guest blogging on ACW. We share new book releases on the ACW blog. In 2018 we’ll post New Releases on the second Monday each month. We collect new release book information in the ACW Facebook Group. Question 6. How can you contribute to the CWD blog? CWD generally posts inspirational blog posts related to writing (inspirational, craft posts, the writing and publication journey, short fiction and poems, conferences and events, and also new releases or member achievements) on Mondays and Thursdays. Our blog team are highlighted on the blogsite with images and a short bio. In 2018, we are looking at some tweaking of this—with Mondays continuing our current content, with writing related and inspired blogs and Thursdays as a series of ‘Meet our Members’ interviews. We may also have occasional writing-craft series. From time to time, we do have opening on our CWD blog team. If you are a CWD member and are interested in guest blogging for us, please contact myself or email. We also value comments on the blogsite as this encourages our bloggers. Question 7. How do you see CWD and ACW as groups that complement each other and also connect with Omega Writers Inc.? All three groups have historic connections and many members in common, with some different emphases. It’s been a delight to see the groups working together with strong connections and support between the administrative teams. CWD aspires to provide an encouraging faith community for writers in which questions can be asked, achievements celebrated, and their books or other publications highlighted. We value interaction and mutual support between members. Both CWD and ACW do not have a paid membership or financial backing, and are primarily active on social media (Facebook, Twitter, Pinterest, Blogsites). Omega Writers’ paid membership and structure enables it to have local writing groups and to provide workshops, Book Fairs, the annual Writers Conference, and the CALEB prize. Omega Writers has made an enormous contribution of writers in the Australasian region and we would encourage you to become a paid member (it’s not exorbitant & has benefits), join a local chapter in your area, and/or one of the focused FB groups. Narelle: ACW strives to promote and market books by Australasian authors. We want to share our love of books with readers and provide posts that will interest readers. Our blog calendar is structured to include educational posts that support writers with relevant information on writing craft, publishing and book marketing. We share a quarterly blog post with CWD from Omega Writers and encourage our members who live in Australasia to join Omega Writers. Omega Writers offer many benefits for writers that aren’t available in ACW, including writing chapters with online and in-person meetings, writing contests for published and unpublished writers, critique groups, writing retreats and an annual writing conference. We support Omega Writers in their goal to promote Australasian authors and books to the wider reading community. Do you have any other questions regarding CWD or ACW? Jeanette and Narelle are more than happy to answer your questions in the blog comments on both blogs and discuss how you can become more involved in our vibrant Christian writing community in 2018.